Oodles of interesting stuff happened in the world of Pittsburgh sports this weekend. Dejuan Blair dropped 32 on poor DePaul; Duquense upset Sean Miller and #9 Xavier; some Cardinals and Steelers reuinted in the annual rite of the offseason known as the Pro Bowl; and the Pens locked horns with the Red Wings. I'll spare you the details of how that worked out. But perhaps the item that stuck out most to me was the photo above, a just-snapped shot of easily the most beloved character in Mondesi's House history, Ronnie Florian. What was really intriguing to me, though, was the story behind the photo; it wasn't shot in Pittsburgh, oh no. 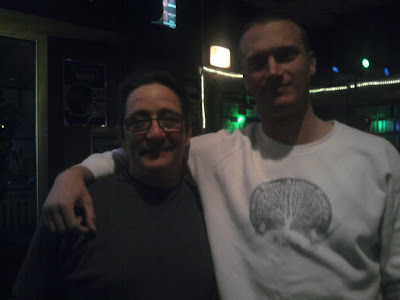 This was actually an encounter between two MH readers (Matt B. and "Nick Dawg") and The Ultimate Pirate Fan in a Daytona, Florida bar the week after Super Bowl 43. It seems that Mr. Florian was attending professional umpire school there and just graduated, so what better way to celebrate than to be bothered for a picture by two wise-acre Pittsburghers who notice you 900 or so miles from home. I'm sure he was thrilled. A close second in this weekend's "Best of Inbox" was this shot of Edgar Snyder at the Super Bowl, from The Jim of Sportsocracy fame. As The Jim reminds me of the well-known Burgh attorney, there's no fee unless he gets money for you. The Civic Arena was chalk full of random jerseys. A Paul Coffey toting guy sitting next someone sportin the Old 29er's jersey. A signed Ron Francis Hartford Whaler jersey. The amazing sightings did not stop there. 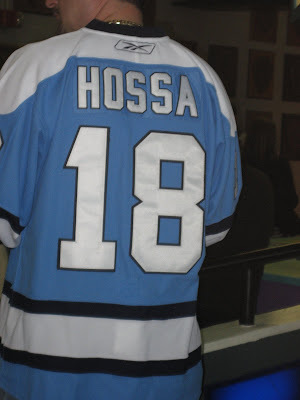 A little treasure that I came across was an interesting powder blue Hossa jersey. This little gem came complete with Winter Classic patch. Because he was with the team for that epic win, right? 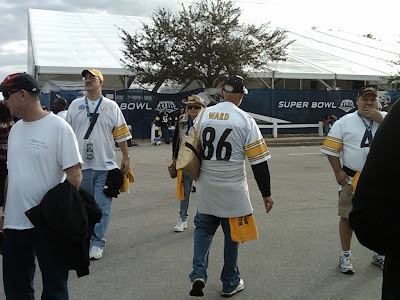 What kind of "fan" has that jersey? Finally, the perennially awesome A.J. 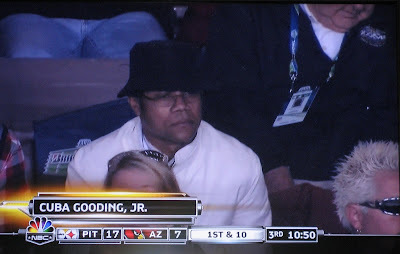 sent over this SB43 screen shot of Cuba Gooding, Jr., notable for the fact that it contains half of Guy Fieri's bleached, sunglassed head to Gooding's left. That means we can finally clear up the debate of whether or not the Food Dude/Jeff Reed lookalike attended the game. The answer is a resounding YES. Don't worry, I'll get back to real sports coverage soon. Much like Kenan Thompson as James Harrison on SNL, I needed a little breather after that SB43 overload. Always remember, any post that can somehow unite Florian, Snyder, Fieri, and Winter Classic Hossa cannot go unheard.